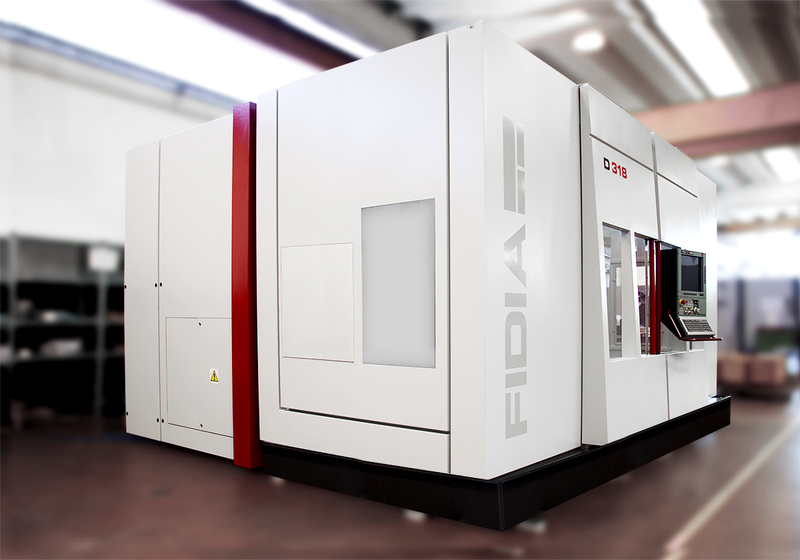 Counting hundreds of satisfied customers world wide, the D218, D318 and D418 models of Fidia 5 axis high-speed milling centres have been recently renewed to keep granting the best return on investment upon machine size. 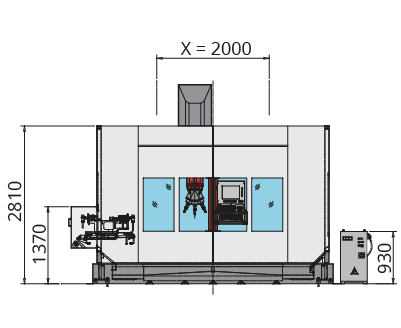 The “D” family offers nowadays an enhanced cinematic delivering up to 22 m/min cutting speed; the new Z axis counter-balance system, together with active cooling system aboard nuts and Y axis motor, grants superior accuracy. Strongly reliable as usual, the machine structure, system layout and body design delivers high-level dynamic performance, while the proprietary 5 axes continue or 3+2 indexed heads and first class spindles confirms its versatility and its effectiveness. 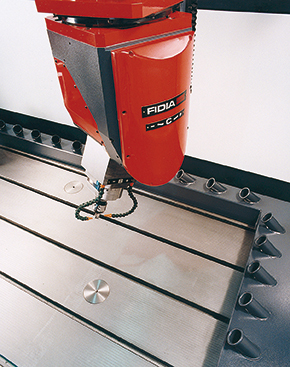 Fidia has been a firm believer in high speed milling and has dedicated years of continuous research to the development of machines that have successfully operated worldwide since the early 90s. Continued market growth confirms the validity of the choices made by Fidia. Whether it’s a 5 axes machining or a 3+2 indexed axes operation, high speed means high cutting speeds and fast spindle rotation. 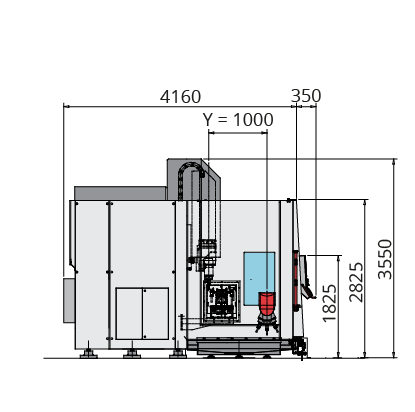 The resulting high axis feeds can only be maintained by specially designed machines in order to guarantee precision and surface quality simultaneously. An initial result is a reduction in machining and manual finishing times. 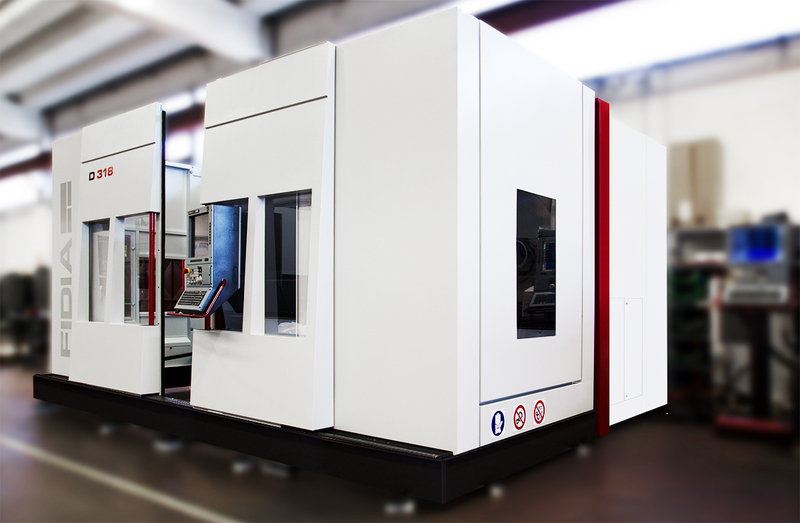 But high speed also means being able to machine very hard materials and thus simplify production cycles avoiding those time consuming mid operations imposed by conventional machining. The “high bed” solution allows for a reduction in moving masses, particularly of the X axis, and results in superior dynamic performance. 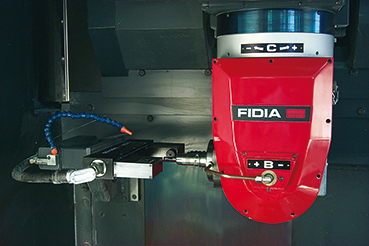 compact continuous bi-rotary head for high speed spindles and HSK40E toolholders. 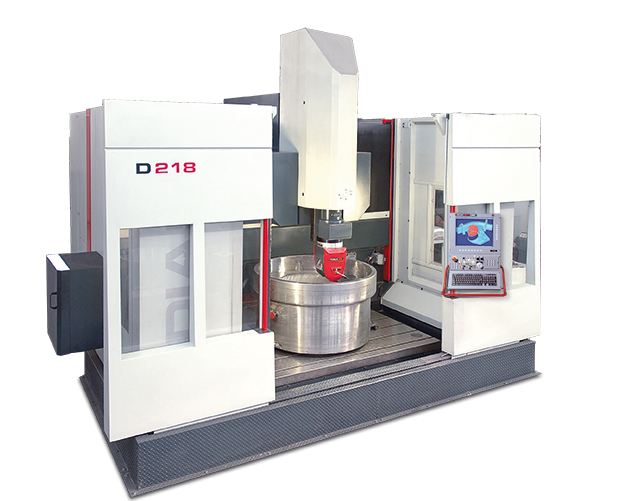 The full 5 axes continuous head hosts ceramic ball bearings and liquid cooled electro-spindle up to 32,000 rpm. Privileged applications are complete machining of light materials, and finishing operations on steel. The 3+2 indexed head offers 22kW high torque electro-spindle, allowing higher removal cutting on steel and other iron-based materials. Spray-mist tool lubrication is provided standard. improvement in resolution and machining accuracy. The linear axis transducers are the direct type in order to guarantee maximum accuracy and maintain this accuracy over time. Axis are driven by re-circulating ball screws and brushless motors. Technology for the vectorial control used for the spindle drives gives an excellent performance even at low rotations. 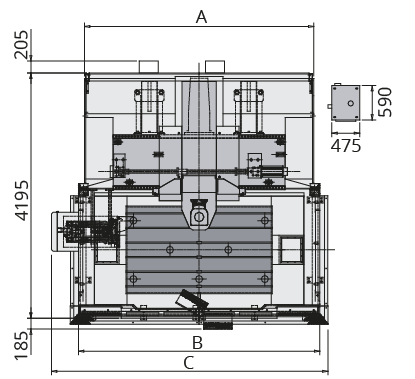 The automatic tool changer is incorporated in the machine tool bed and is protected from swarf and coolant. Tools can be loaded in complete safety from the left part of the machine in masked time. Automatic presetting of tool length on the machine simplifies tooling procedures for new machining operations or when replacing worn tools. Indispensable for unmanned operations, tool presetting is available either in a digital probe version or with a focused laser probe. 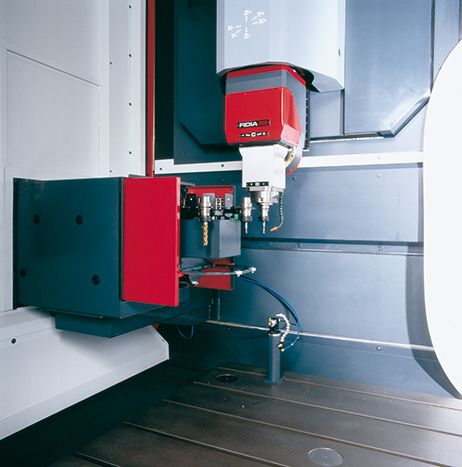 In addition to verifying tool length, the focused laser system checks tool diameter and shape. Essential when machining graphite or resins, the dust suction unit consists of a high capacity suction device mounted externally to the machine. The suction device is equipped with self-cleaning filters, offering a high degree of filtration, that are able to operate in the presence of explosive dust. 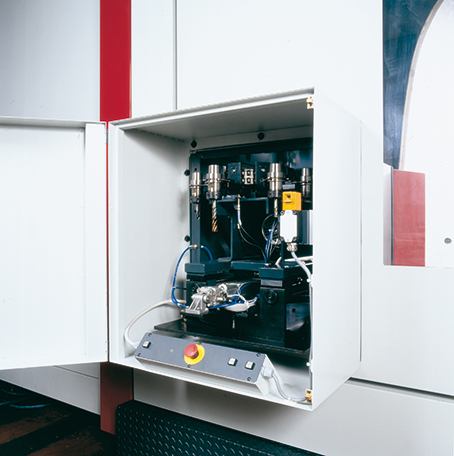 The suction device is connected by means of special tubing to the manifold inserted in the basement of the machine. 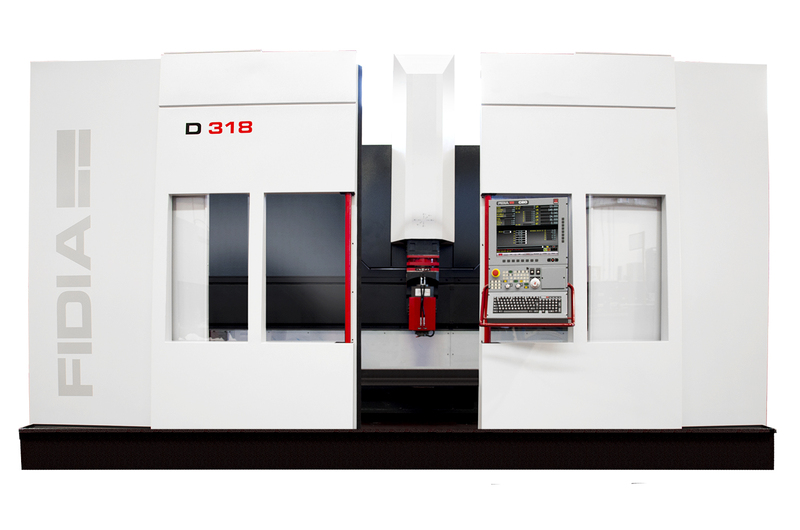 The machine tool structure, with the slides located far away from the work area and the total absence of moving parts below the work surface, make the D218 and D318 particularly suitable for this application.